On the edge of a small Bulgarian town on the southern bank of the Danube River lies a relic from communism with eerie echoes of one of the Soviet era’s most infamous places. Empty apartment buildings squat on the snow like forgotten boxes. Windows are broken, facades are crumbling and weeds flourish where gardens were meant to blossom. It looks like the ghost town at the abandoned Chernobyl nuclear site 1,200 kilometers (750 miles) north. Except the crucial difference is that the one at Belene in Bulgaria was never occupied, save for the occasional squatter. The buildings were erected in the 1980s by the government to house workers at a planned facility. But the project was scrapped, revived and scrapped again during the eastern bloc’s transition from communism to capitalism. Now, in the heart of the European Union’s poorest corner, Bulgaria plans to get the nuclear plant off the ground for real. Facing a dilemma that’s familiar across the continent, the government says the nation can’t keep up with demand for electricity any other way. It will solicit bids from investors early next year to build a 2,000 megawatt plant at a capped cost of 10 billion euros ($11.4 billion). The land, empty apartment blocks, already prepped foundations and two unused Russian-made reactors will be thrown in as incentives. Like with nuclear projects everywhere, there’s opposition and—given Bulgaria’s track record—plenty of skepticism as the government makes its case with promises that the effort won’t break state coffers or saddle taxpayers with the bill. It’s a hard sell. Governments, builders and investors across Europe are shying away from the high cost of nuclear construction and turning toward renewable energy sources such as solar and wind. The consensus of local residents, industry analysts, economists and even some lawmakers is that it won’t work. And if it does, it will be for the benefit of Russia trying to wield influence in Bulgaria. The Center for the Study of Democracy based in the Bulgarian capital reckons there’s no need for new capacity for almost another three decades and the plant would generate losses of 4.5 billion euros by 2050. ……..Behind a kilometers-long barbed wire fence outside Belene, the proposed plant site boasts a handful of buildings and careworn warehouses. 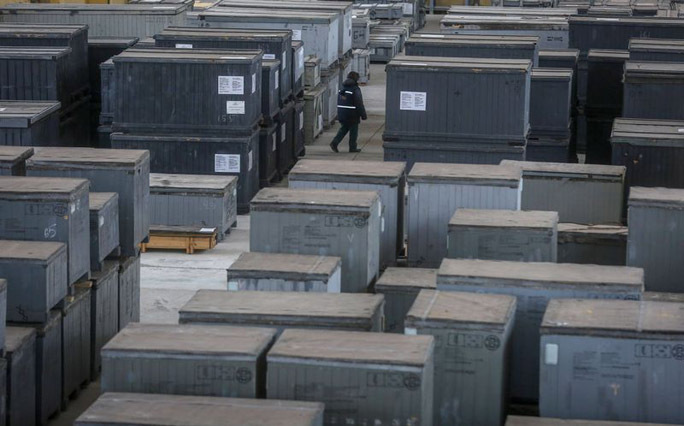 Inside them are grey wooden crates stuffed with equipment meant to secure the reactors to the foundations and connect them to the system. There is also a water treatment facility ready to go online, a spur of railway track and a concrete plant ready to pour. The only sign of the foundations is a flat, sunken section of ground larger than a football field and surrounded by 15-story cranes that haven’t been used since the 1990s. The reactors, bought from Rosatom in the last attempt to get the project going, are each rated at 1,000 megawatts—about the same output as Chernobyl reactors. They sit in a field boxed up against the elements. Though the Bulgarian government is sticking to its cost estimate, most analysts say cost overruns are typical in the industry. Because of that and the strict conditions that free Bulgaria from any financial responsibility, the number of prospective investors may be limited to Russian and Asian companies. China National Nuclear Corp. and Korea Hydro & Nuclear Power Co. have both expressed interest. A new warning for dangerous levels of radiation in the Vromos Bay near Chernomorets was issued by the health authorities. In Bulgarian and English, a new plate warns that the sandy strip is dangerous, a BBC report showed. Radiation contamination is high – in individual areas up to 50 times the norm. However, access to the beach is not prohibited, the risk of using it is the responsibility of the people on holiday. Ore mined decades ago from the nearby Rosen mine were high in uranium. Part of the waste water is discharged into the bay. “The difference in the content of radionuclides in the sand and in the soil along the sand strip in relation to this terrain compared to the other terrains we are exploring all along the Black Sea is here between 5 and 50 times.” The life of these radioisotope elements until decay is considerable, it exceeds 90-100 years, “explained Verginia Tsanova – Deputy Director, RZI – Burgas. The effect of staying for a long time on the sand is not immediate, but it can be seen in years, warn health authorities. Small children also risk swallowing sand. “It has a carcinogenic effect, and it leads to genetic mutations in the genital cells, from there to the offspring, which is extremely dangerous for young people and for pregnant women,” Tsanova added. Verginia Tsanova stressed that there is no way to ban the use of the beach. “It’s people’s choice, we just have to warn them,” she said. The beach is without a concessionaire and is preferred by families with children. The Bulgarian parliament has approved a plan to revive the Belene nuclear power plant five years after the Russian project was suspended due to financing problems and concerns about relying too heavily on Russian energy. The parliament on June 7 approved by 172 to 14 Prime Minister Boyko Borisov’s proposal to develop a plan to resume construction of the plant on the Danube River by the end of October. Bulgaria had already spent around $1.8 billion on the plant when the government in 2012 put a moratorium on further workunder pressure from the United States and European Union to limit its energy dependence on Russia. Bulgaria also suspended the joint project with Russian company Atomstroyexport because it failed to find any foreign investors prepared to shoulder its spiralling costs, estimated at about $11.8 billion in total. The suspension angered Russia, which had hoped to use Belene as an EU showcase for its new generation of pressurized water reactors. Sofia had to pay more than 620 million euros to Russia’s Rosatom for scrapping the project, but it also received nuclear parts for two 1,000 megawatt reactors, which were conserved and maintained. Last week, Energy Minister Temenujka Petkova said that a campaign to pick a strategic investor for the project would be launched by the end of 2018. Russia’s Rosatom has said it will make another bid to complete the project. Also in the running are Chinese state nuclear company CNNC and France’s Framatome, which is majority controlled by EDF. Petkova said the government does not want to commit more public funds, extend state guarantees for any loan, or sign any long-term electricity supply deals to make the project viable. Vadim Titov, director of Rosatom Central Europe, told a Bulgarian energy conference on June 7 that the Russian company is ready to start talks with the Bulgarian authorities on reviving the project. The Belene plant’s two 1,000 megawatt reactors were intended to replace four old Soviet-built units that were shut down more than a decade ago amid security concerns at the only existing nuclear plant in Bulgaria, at Kozloduy. There are still two Soviet-built operational reactors at Kozloduy, dating back to 1987 and 1991, which provide about 30 percent of the country’s electricity. Dozens of Bulgarians protested outside parliament against the government’s plans for Belene on June 7, saying the project’s benefits were not enough to justify its costs and contending that it has been a source of corrupt practices for decades. Danube River, the prime minister said on Saturday. Russia, which would have supplied some equipment. Bulgaria Seeks Private Investors for Nuclear Project, US News, May 11, 2017, SOFIA (Reuters) – Bulgaria is seeking private investors to build a nuclear power plant on the Danube River, which was canceled five years ago, Prime Minister Boiko Borisov said during a phone call with Russian President Vladimir Putin on Thursday. Bulgaria’s NEK settles arbitration damages for shelved Belene nuclear plant http://sofiaglobe.com/2016/12/09/bulgarias-nek-settles-arbitration-damages-for-shelved-belene-nuclear-plant/ Bulgaria’s state-owned electric utility NEK has paid 601.6 million euro in damages to Atomstroyexport, the foreign contracts subsidiary of Russia’s state nuclear corporation Rosatom, Energy Minister Temenouzhka Petkova said on December 9 during question time in Parliament. The money was transferred into Atomstroyexport’s accounts on December 8, Petkova said. In a statement, Atomstroyexport confirmed receipt of the funds and was satisfied with the fact that NEK disbursed its commitments in full under the terms of an agreement signed in October, which saw the Russian company drop the daily penalty interest as long as NEK paid the principal owed by December 15. The accumulated amount of daily penalties would have reached 23.8 million euro by that date. NEK’s agreement with Atomstroyexport also saw the Russian company accept a 20.9 million euro deduction in the original amount of damages ordered by arbitration, following several objections raised by the Bulgarian side to the calculation methodology. Atomstroyexport was picked to build two 1000MW nuclear reactors at Belene on the Danube River, a project that was shut down by Bulgaria in 2012. The Russian contractor filed for arbitration, asking for 1.2 billion euro in damages for equipment ordered for the nuclear power plant, which NEK never paid for, and won the court action in June, although it was awarded just over half of the amount it claimed. NEK decided not to appeal the ruling in September after Parliament passed a bill on September 28 that authorised a cash injection from the state Budget to NEK to pay the damages awarded by the tribunal. The delay in the disbursement was due to the fact that Bulgaria was waiting for the European Commission to rule on whether such a transfer was allowed under the EU’s state aid rules. The Commission gave its approval earlier this week, according to reports in Bulgarian media. NEK will now take ownership of the equipment manufactured by Atomstroyexport, but uncertainty remains about what the company will do next. Bulgarian officials travelled to Iran earlier this year to discuss a possible sale of the equipment, but there has been no development in the months since then. Speaking to reporters in Parliament on December 9, Petkova said the Belene assets – the site itself and the equipment from Atomstroyexport – could be spun off into a separate company that would be put up for privatisation. “If there is [investor] interest, then the [Belene nuclear power plant] project could be carried out on a market basis. If there is no investor interest, we will go in another direction and seek other options,” she said, as quoted by Bulgarian National Radio. China eyes nuclear project in Bulgaria http://www.euractiv.com/section/energy/news/china-eyes-nuclear-project-in-bulgaria/ A delegation from the China National Nuclear Corporation (CNNC), the country’s largest state energy company, visited Sofia and met with Bulgarian Prime Minister Boyko Borissov, to possibly resuscitate a shelved nuclear power plant project.The Belene nuclear power plant, situated near the Danube, was frozen in 2012, reportedly due to a lack of funds. Bulgarian ex-energy minister charged over nuclear project http://www.reuters.com/article/us-bulgaria-nuclear-charge-idUSKBN13C1KP 17 Nov 16, Bulgarian prosecutors charged former economy and energy minister Rumen Ovcharov on Thursday with mismanagement that led to state losses of more than 190 million euros ($200 million) related to a canceled nuclear power project with Russia’s Atomstroyexport. Bulgaria canceled the 10-billion-euro Belene project on the Danube River in 2012 after failing to find foreign investors and under pressure from Brussels and Washington to limit its energy dependence on Russia. An arbitration court has ruled Bulgaria needs to pay over 600 million euros in compensation to Atomstroyexport over the project, which analysts and politicians say reflects widespread corruption in the Balkan country. Prosecutors charged Ovcharov, energy minister from 2005 to 2007 in a Socialist-led government, for failing to exercise sufficient control over the executive directors of state energy company NEK and allowing them to sign a deal with Atomstroyexport for the nuclear power plant at Belene. The prosecutors said that in November 2006 NEK’s chief executives signed a 193 million euro agreement with the Russian company to start work on the project in breach of public procurement laws and before the plant’s financing was agreed. Prosecutors have already pressed similar charges against Ovcharov’s successor, former economy and energy minister Petar Dimitrov. Last month the former directors of NEK, Lubomir Velkov and Mardik Papazian, were charged with causing financial damage by signing another deal with Atomstroyexport, costing the business more than 77 million euros. Ovcharov has previously denied any wrongdoing. He was not immediately available for comment. Russia demands swift payment for canceled Bulgarian nuclear plant , Reuters, 10 Sept 16 Russian nuclear company Rosatom has asked Bulgaria to swiftly pay 620 million euros ($696 million) in compensation over the canceled Belene nuclear project, it said on Saturday. An arbitration court ruled in June that Sofia must pay for the equipment produced by Rosatom for the project, which Bulgaria abandoned in 2012 due to financial constraints and concerns in Brussels and Washington over its energy dependence on Russia…….Bulgaria’s prime minister has said that the compensation, estimated by Sofia at about 560 million euros, will be paid in full and quickly, to avoid paying interest of 167,000 euros a day. Bulgaria is considering selling the 2,000 megawatt nuclear project to private investors, keeping a small state stake in it, after its attempt to sell the equipment to Iran did not succeed. Bulgaria seeks least worst outcome for Belene nuclear fiasco BME IntelliNews, By Clare Nuttall in Bucharest August 25, 2016 More than two months after an international court ruled Bulgaria must compensate Russia’s Atomstroyexport for work carried out on the Belene nuclear power plant, Prime Minister Boiko Borissov’s government is still struggling to find ways to minimise the financial damage from the project, which was cancelled back in 2013. A Geneva-based court under the auspices of the International Chamber of Commerce ruled on June 16 that Bulgaria’s state National Electricity Company (NEK) must pay €550mn to Atomstroyexport, a unit of Rosatom, for the nuclear reactor the Russian company has already produced. While the figure is lower than the €1.2bn sought by Atomstroyexport, it is a substantial sum for Sofia, when taken in combination with the €708mn Bulgaria has already sunk into the project. In addition, Bulgaria faces a bill of around €170,000 in penalty interest per week. In an analyst note issued after the ruling, Timothy Ash of Nomura wrote that the order to pay compensation was a “significant blow to Bulgaria, with a cost of well over 1% of GDP eventually likely to fall on public finances”. The options for the Bulgarian government are limited; far from finding the optimal solution for the country, it is a case of searching for the least costly and damaging outcome…….. Reviving the project could therefore be a case of throwing good money after bad, as Sofia invests yet more money only to end up with a costly white elephant power plant. This is the argument put forward by Greenpeace Bulgaria, which campaigned against Belene together with several other environmental NGOs. Bulgaria to revive Belene nuclear power project with private help http://www.reuters.com/article/us-bulgaria-nuclear-idUSKCN10N154 Bulgaria wants private investors to help it restart the Belene nuclear power project after a court ruled Sofia must pay hefty compensation to Russia over equipment ordered for it, Prime Minister Boiko Borisov said on Friday. The Balkan country had canceled the 2,000 megawatt project on the Danube River in 2012 due to financial constraints and after pressure from Brussels and Washington, who said it would only increase Bulgaria’s dependence on Russian energy imports. An international arbitration court ruled in June that Sofia should pay more than 550 million euros ($623 million) in compensation to Russian nuclear giant Rosatom over the two nuclear reactors ordered. Borisov, however, said that the Black Sea state still does not have enough financial resources to build the nuclear plant.”Let us make it a private project through the privatization agency with various options for the state’s share. This is the solution,” he said. Bulgaria must pay Russia over cancelled nuclear project, says court. An arbitration court has ruled that Bulgarian state energy firm NEK should pay nearly 550 million euros (437.70 million pound) in compensation to Russia‘s Atomstroyexport for a cancelled nuclear power project, Bulgaria’s energy minister said on Thursday. “NEK received the court’s decision late last night. It is still not handed down officially. In the next days, NEK will approach Atomstroyexport over the decision,” Energy Minister Temenuzhka Petkova told reporters. Atomstroyexport had sought more than 1 billion euros at the Paris-based International Court of Arbitration against NEK over the cancellation of the Belene nuclear power plant it had been contracted to build. NEK teamed up with Atomstroyexport to build two 1,000 megawatt reactors at Belene, on the Danube River at the border with Romania, in 2006. Sofia abandoned the project in 2012, after it failed to attract investors for the 10 billion euros ($11 billion) scheme and also came under pressure from its Western allies about its energy dependence on Moscow. Petkova said the court has ruled that NEK should cover the funds the Russian state company had spent to produce equipment for the project, but has rejected claims for additional works and damages from lost profits. Bulgaria is currently extending the lifespan of its two 1,000 Soviet-made reactors at its Kozloduy nuclear power plant and is looking for an investor to build one more reactor at the same site.